Cedar Springs Lodge offers premium accommodations and gourmet breakfasts in one of the most fabulous summer and winter destination resorts in North America – Whistler, British Columbia. Cedar Springs Lodge is located on the outskirts of world-famous Whistler Village, set amongst some of the most beautiful mountain scenery to be found anywhere in the world. In summer and winter, you will always find a variety of exhilarating activities here. Whether you choose mountain biking, skiing, golf, or zip-trekking through old growth tree-tops, let us be your guide and tailor your perfect experience. With fully-appointed private guest rooms, our lodge is ideal for couples, families or groups. 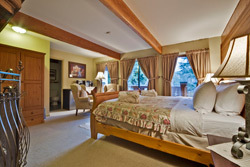 A stay at Cedar Springs Lodge is the ideal way to enjoy your vacation at Whistler Resort. In winter, after a long day of skiing on Whistler and Blackcomb Mountains, soak in our sundeck hot tub, or cozy up in front of the fireplace. In summer, a myriad of hiking and biking trails are literally right at our doorstep, while trout streams and several top flight golf courses beckon just minutes away. 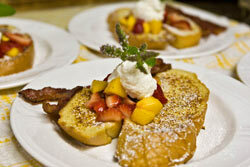 And of course, you’ll always start your day with our sumptuous, multi-course gourmet breakfasts, served by a crackling wood burning fireplace in fall and winter, and featuring fruits, cereals, fresh breads and pastries, coffee, tea and an assortment of hot dishes both savory and sweet that vary every morning – all lovingly-prepared by Chef Jackie. And speaking of eating, at Cedar Springs Lodge, you’re just down the road from Whistler Village with dozens of fine restaurants offering international menus as well as a wide choice of nightlife. 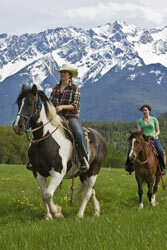 Cedar Springs Lodge welcomes everyone, from honeymoon couples to families with children and even groups. Our lodge is a great place for a family reunion and can accommodate more than 20 people in all. At breakfast and in our guest lounge, you’ll meet and make friends from around the world, who like you may have travelled far to enjoy the beauty, nature and mountain ambience that is Whistler. Whether you are one, two or many more, Cedar Springs Lodge is homey and casual, with a relaxed family atmosphere – you will feel like family by the time you leave! Sunken Hot Tub located outside on the sundeck. Guest Lounge with river rock fireplace, home theatre TV, VCR, DVD player and video library...snuggle up on a couch with a good video or a good book...don't forget the hot chocolate with freshly baked cookies served every afternoon! Restaurant reservations and ski lift ticket sales (10 day advance). Hiking and biking trail maps and local insights; on-site bike rentals. Complete Activity Booking Service from snowmobiling, ATV, dog sledding, zip trekking, horseback riding – you name it and we’ll arrange it. Our eight rooms range from a single to a large room with two queen beds and two singles that can accommodate six people. Most of the rooms have either queen or king size beds – some beautifully crafted out of pine logs – and feature warm pine and natural wood furniture. The majority of the rooms also have private baths and all have large armoires, shelved closets and extra hanging space. Newly-weds and romantics of all ages will especially enjoy the spacious honeymoon suite with its king size bed, wood-burning fireplace and other special furnishings and amenities, plus a balcony with a stunning view of Whistler and Blackcomb Mountains. In addition, one of the rooms is wheelchair accessible. All of the rooms are clean, quiet and comfortable. “Come and experience our mountain lifestyle for yourself. We look forward to sharing it with you!” Joern and Jackie Rohde, your hosts at Cedar Springs Lodge. A bed and breakfast accommodation should be a much more personal experience than a hotel and that’s exactly what Cedar Springs Lodge hosts Joern and Jackie Rohde provide. Joern, a professional photographer whose photos of the area adorn the Lodge walls, and Jackie, an Australian native, are happiest providing “remarkable service” to their guests. The two hosts transform your stay from simply a truly nice B & B into a memorable one – friendly, helpful and knowledgeable, Joern and Jackie genuinely care about every one of their guests. Whether a first time or repeat visitor, you are made to feel welcome and at home. 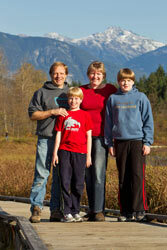 Welcome to Cedar Springs Bed & Breakfast Accommodations in beautiful Whistler, British Columbia! !